Exilarch in Bagdad, probably between 773 and 816. Until recently his existence was known only from a difficult passage in a manuscript, part of which is printed in the "Maẓref la-Ḥokmah." 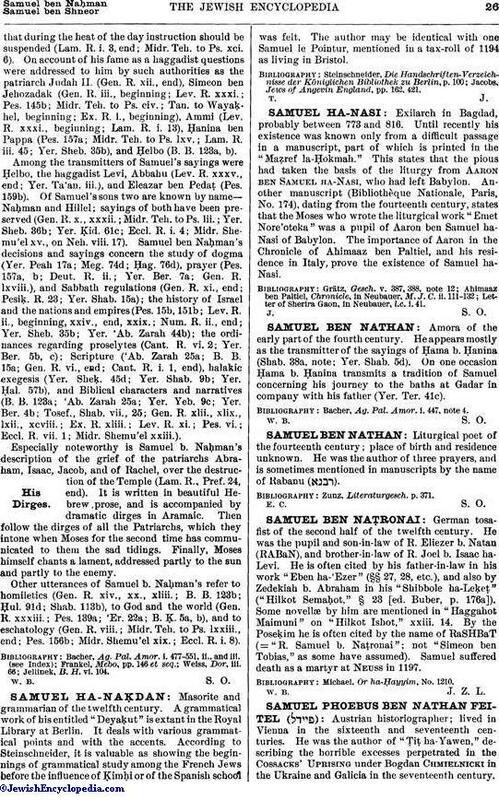 This states that the pious had taken the basis of the liturgy from Aaron ben Samuel ha-Nasi, who had left Babylon. Another manuscript (Bibliothèque Nationale, Paris, No. 174), dating from the fourteenth century, states that the Moses who wrote the liturgical work "Emet Nore'oteka" was a pupil of Aaron ben Samuel ha-Nasi of Babylon. The importance of Aaron in the Chronicle of Ahimaaz ben Paltiel, and his residence in Italy, prove the existence of Samuel ha-Nasi. Letter of Sherira Gaon, in Neubauer, l.c. i. 41.